Get a quick View inside of you Oracle Forms Application. Make the invisible visible. PITSS.CON Source Code Analytics analysis all Level of a complex Oracle Forms and Reports Application on Source Code Level. The module delivers information about Quality and Complexity. You get a lot of Key Data like most used objects, Lines of Code, Comment Ratio and a lot of others. Problems will be visible, Progress will be measurable. 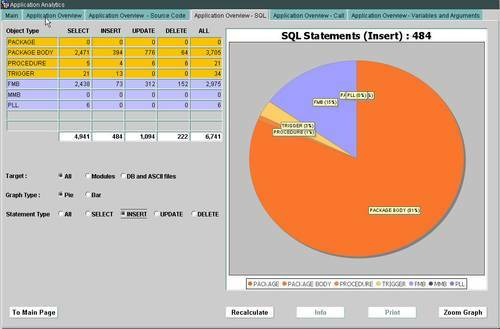 Oracle Forms Applications – load, analyse and understand, including SQL, PL/SQL, Script and a lot of others. Make Quality measurable and display the Progress of a Development on all Levels in a Visual way. Provide Online Reports for the Management, to control the Application pro active, qualify and improve the Application and Development of the Developers.